Trends such as virtualisation and cloud have become the reality in many SMB IT environments, transforming IT architecture. However, some parts of SMB IT still remain better served with physical servers and on-premises storage, creating a heterogeneous environment. For these SMBs, the best data protection strategy is one that works across physical, virtual, and cloud components. Requirements for heterogeneous backup solutions include robust recovery that is simple and repeatable, the ability to choose among application agents vs. agent-less, and the ability to migrate physical resources to virtual. Acronis is a leading provider of easy-to-use DR and data protection solutions in heterogeneous environments—solutions that are cost effective today and in future. Acronis has the scale and capabilities for medium to enterprise deployments, but also offers a strong solution fit for SMBs when deployed with Drobo storage. The great debate on tape vs. disk backup is still raging on among IT experts. For small IT organisations, tape has historically offered a complex, yet practical, way to back up onsite and for offsite vaulting. Today, disk for backup can be just as affordable and sometimes more affordable, although cost is not always the main factor. As these same organisations implement virtualisation, their users expect everything fast: fast provisioning, fast migrations, and fast recovery. Disk backup offers better protection and much better recovery times than tape. For virtual servers, disk is the clear choice. But what about a small organisation with virtual servers in addition to some remaining physical servers? Since not all servers are candidates for virtualisation, this is a common situation. A heterogeneous environment such as this requires a specific approach to data protection. Having two backup media types for onsite backup and two different backup methods is inefficient. Not only in terms of cost, but also in terms of limited IT resources to manage two different backup systems onsite. And offsite backup with disk poses additional challenges. Drobo and Acronis Backup & Recovery Virtual Edition are a great match for small and medium organisations who need a powerful backup solution that is fully featured, yet easy to use. The CIFS operation of the Drobo B800fs lends itself to the easiest possible restore scenarios on premises and from offsite backup. Acronis Backup & Recovery Virtual Edition offers deduplication for the most efficient use of disk storage locally or across a WAN. With the B800fs, you can use built-in Drobo Sync software for automatic offsite backup or Acronis Backup & Recovery Virtual Edition to stage backups directly to an offsite B800fs. The solution is distinguished by its ability to protect both physical and virtual servers. Whether using agents or agentless operation, both fullimage and file-level recovery is available when you need backup data. Data migration is another benefit of choosing a backup technology that supports changes in the infrastructure. For physical servers that will remain physical, Acronis Backup & Recovery Virtual Edition can help easily move to new hardware, and also move a physical server to virtual machines (VMs). With capacity as affordable as Drobo B800fs, storage can also be used for other general-purpose file sharing needs in the environment. Deploy B800fs storage, easy automatic setup with Drobo, configure shares. Install Acronis Backup & Recovery Virtual Edition using the simple installation wizard. Launch Acronis Backup & Recovery Virtual Edition and use the management server to create a backup plan. 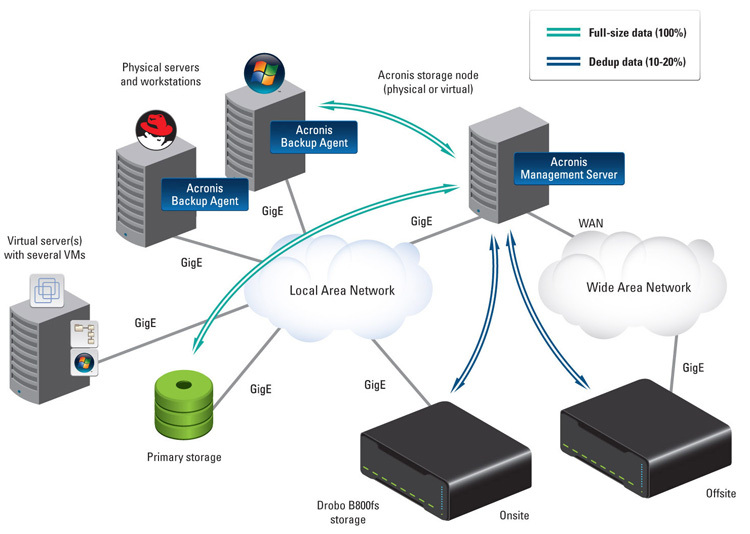 Refer to Acronis User Guide for more detail specific to options @ www.acronis.com/download/docs/abr11a/userguide. Test backup and recovery, you now have heterogeneous backup! Protecting data is important, but cost and complexity often prevent small companies and departments from protecting all of their systems. The economies and ease-of-use built into Drobo make it a superior choice as backup storage for image-level backup. The B800fs enables the simplest restore possible and serves as a storage appliance that manages protection from hard drive failures. Expand storage by adding disk drives as your backup needs grow. If you can follow the colors of traffic signals, you can operate a Drobo. Drobo provides superior data protection for your backups with BeyondRAID™ technology. The B800fs, an ideal fit for the on-premises backup, is also well suited as storage for offsite backup with built-in Drobo Sync built-in at no additional cost. With Acronis, you also have the option of staging backups to a remote site using your backup server. Whether for onsite backup, offsite, or both, Drobo integrates seamlessly into your existing environment.